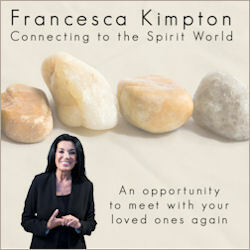 This audio program consists of three meditations which will enable you to connect with your own loved ones in the spirit world and allow you to receive their help and guidance in very practical ways on a daily basis. This guidance will help you to relax and gain peace of mind but more importantly, allow you to redirect your life with the aid of spirit in order to work towards greater success and happiness. The program consists of four tracks. Track 1: Introduction: this will give full instructions and some tips to help you gain the most benefit from the meditations. It is essential you listen to this first before attempting the meditations. Track 2: Connecting to the Afterlife: A chance for you to have the experience of meeting one of your loved ones in the spirit world. Track 3: Heart to Heart with Spirit: Your personal journey with your own spirit helpers. During this exercise you will receive support and guidance from your spirit helpers. This will help you to move forward in life by receiving information to to enable you to overcome any current difficulties and achieve your goals in life. Track 4: Emergency Rescue: For those occasions when you do not have the time to do the longer meditations; this is something you can do every day to help you to make the most of each day and keep your mind focused and ask spirit for help with everyday matters. Or order a physical CD, for $20 each plus P&P, by clicking on the Buy Now button. Please note: you do not need to have a PayPal account to use this button.